Across the globe, there is a delicate balance between sustained investment in essential infrastructure and a corresponding advance in socioeconomic progress. Telecommunications platforms have become the driver of growth in the twenty-first century. It's now the forward-thinking key performance indicator that all economists must monitor, in addition to the GDP. Infonetics Research has released excerpts from its latest market study, which analyzes global and regional market trends and conditions affecting telecom service providers, enterprises, subscribers, and the global networked economy. "As 2012 ended, Europe's crisis remains un-contained and is now spreading to Germany. The potential of shaking business confidence everywhere in the world has risen to new heights, and the IMF lowered its growth forecast and is warning of recession risks due to downward revision of global GDP, which now stands at 3.3 percent," said Stephane Teral, principal analyst for mobile infrastructure and carrier economics at Infonetics Research. Economic readings are worrisome nearly everywhere except the U.S. market, but so far the impact on global telecom and enterprise technology spending is not severe. As a result, Infonetics has forecast capex to grow nearly 4 percent in 2012 -- when compared with 2011. Moreover, with the announcement of AT&T's and Deutsche Telekom's significant multi-billion dollar infrastructure investment plans, capex outlay looks brighter in 2013. 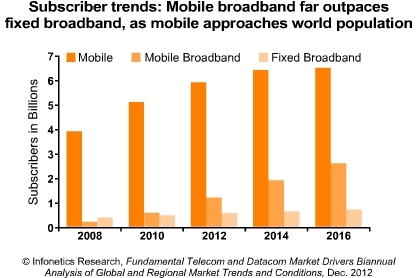 Globally, mobile service revenue is the main growth engine in the overall telecom/datacom market, up 4.3 percent year-over-year in the first half of 2012. User mobility, specifically BYOD anywhere, is putting pressure on carriers to move to a single network for fixed and mobile access, internet traffic, and private/premium services. Data traffic growth is outstripping transport equipment costs: traffic is climbing 29 percent annually while equipment costs are falling 10 percent. Software-defined networks (SDNs) are here to stay, but not today: SDNs are on service providers' minds, but it is a longer-term challenge to find implementations of hybrid SDN and non-SDN in live networks. The phase out of stimulus monies and pressure on government budgets is decreasing public sector spending and taking a bite out of overall enterprise growth. With security top of mind due to unprecedented threats and the growing BYOD trend, businesses everywhere are looking to integrate security into everything from smartphones to routers and switches, and are evaluating data center security appliances, cloud security services, and security for virtualized environments and public and private clouds.